A DISTRESSED sheep which plunged 200ft down a cliff was rescued yesterday by Lough Swilly RNLI. The alarm was raised at 4.30pm on Sunday when three local fishermen spotted the stricken animal stranded on a ledge in a ravine at Leenan Head, Clonmany, with way out. The fishermen contacted Malin Head Coast Guard and Lough Swilly’s inshore Atlantic 85 lifeboat was requested to launch. A kayaker who had also arrived on scene, first paddled in close to the cliff in an attempt to encourage the animal back up the hill. 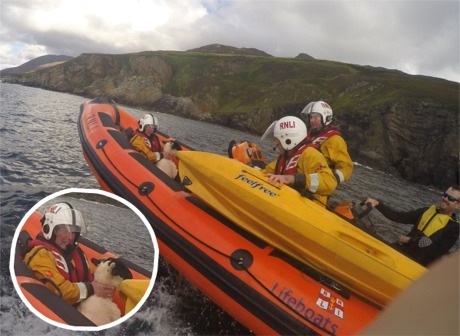 Young ewe is sheepish after dramatic Leenan Bay rescue. The lifeboat crew and the kayaker then proceeded to enter the water and make their way towards the sheep where they safely caught her and gently placed her in the kayak before transferring her into the lifeboat. Once onboard the lifeboat, the sheep was comforted by the crew and safely brought back to more familiar surroundings on shore. Lough Swilly RNLI volunteer press officer Joe Joyce said: "We think the young sheep had fallen about 200 feet and with nowhere to go she was shaking from her ordeal by the time we took her onboard the lifeboat. "The RNLI is often called upon to rescue animals and we are always happy to assist not only to bring them to safety but also to ensure the safety of pet owners or farmers who may risk their own life in attempting to bring their animal safely back to shore."